In java you can lookup connections and datasources with JNDI. The Oracle java libraries enables you to do this against the OC4J Container with rmi or against the OID server with ldap ( probably this will work with other ldap servers too). The first part of this blog is about the ldap jndi lookup and second part is about the rmi lookup. I use the ldap server of Oracle Identity Management 10g (10.1.4.0.1) to register the connection, which you can download at otn. First we have to rename the object OracleDBConnection and its cn attribute to lowercase. Now we can register the connection with java. We have to set server_dn so java can find the oracledbconnection object. In all the Oracle examples they use searchbase but this is not going to work then you get the following error message cn=oracledbconnections,null. This is how it looks in ldap. Now you can store your connection in the ldap or Application Server. If you know jaxb 1.0 then you know that xjc generates many classes. With the coming of jaxb 2.0 this is a lot less thanks to annotations and the 2.0 version supports now more xml schema types. In this blog I will show how you can use jaxb 2 in JDeveloper 10.1.3 and in 11g and give some tips how to use it. 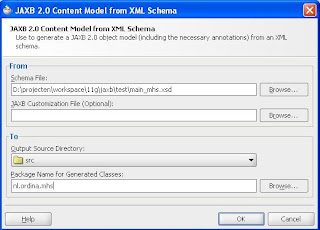 JDeveloper 10.1.3 supports jaxb 1 and JDeveloper gives you a wizard where can generate the classes by selecting a xml schema. Go for the wizard to the menu tools and then go the jaxb compilation menu item. If you want to use jaxb 2 then you should read this blog, this explains how to get jaxb 2 support in jdeveloper 10.1.3. In JDeveloper 11G you can use jaxb 1 and 2. If you do New and go to business tier / toplink jpa then you see the jaxb 1 and 2 options. 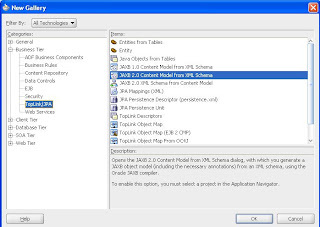 If you use JAXB 2.0 Content model from XML schema then we see the following wizard. You can better change the element to xs:any. Now jaxb generates setData(Data value) where Data is a class where you can set an Element. Now the marshaller generates a nice xml with an embedded xml. 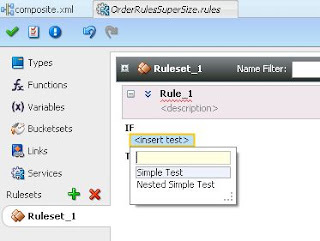 With the new soa suite patch ( 4 feb ) for the jdeveloper 11g TP3 release we can test the business rules. The 11g version is a totally different then the 10.1.3 version. 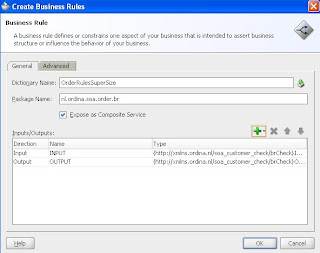 The first thing is a lot easier to make business rules and you can expose these rules as web services so you can use it in other applications. In 10.1.3 you have a binary br repository which you can use. 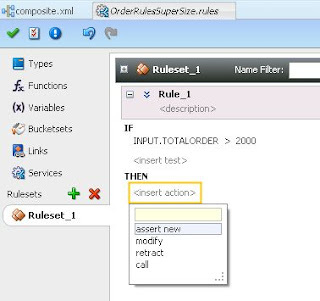 Now you create service in the BR to expose a particular ruleset or function. 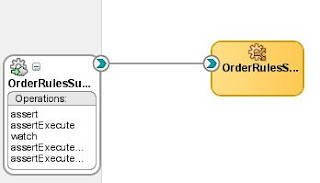 You can also use business rules to create advanced approval routing in the workflow component. Because I checked the expose as composite service you can see that soa suite creates a webservice. 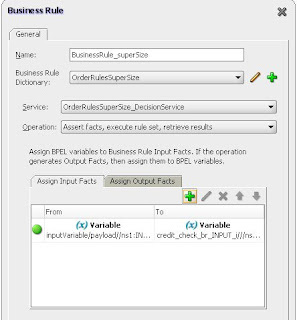 If we open the new BR then we see that soa suite has created xml facts of the input and output element. This is done with jaxb. 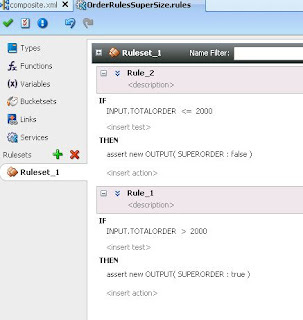 Soa suite also creates a service which calls the empty created ruleset. You can add more services based on br functions or other rulesets. To the created the ruleset we can add a new rule. We select a simple test where we check if the total order is greater then 2000. Next I select the input element, > and 2000. Now we can add the return value. Choose assert new. We are ready with the composite part now we can go to bpel where we add a business rule to the right place in the bpel designer. We have to select the just created br and the right operation, in my case assert facts , execute and retrieve result. We also have to assign the input and output variable of the br. This is how it looks when we open the business rule scope. For 24 uptime systems is it very important to have an easy and quick failover. In this blog I will explain how you can implement an ESB failover without creating adapter for the primary and secondary systems. In this example I use jdeveloper 10.1.3 and I use jms adapters but you can implement this with other out adapters too. To do this I use a xslt to change the header of the jms adapter to set JMSDestinationName with the primary or secondary resource. To know if the backoffice system are in failover I use a domain value map. Now we can add the jms adapter to esb project. I use jms as a outgoing adapter and use a file adapter as incoming. It is important to name the resource provider jms_scott because we added this resource to the application.xml. The destination name is primary location url, in my case java:comp/resource/jms_scott/Queues/SCOTT.JMS_IN . 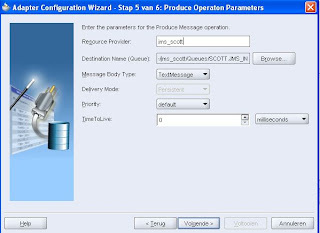 jms_scott is the primary resource and SCOTT.JMS_IN is the schema name with the queue name. The secondary location url looks like this java:comp/resource/jms_scott2/Queues/SCOTT.JMS_IN2. The next step is to create a domain value map in the esb console. With this domain we can control the esb to use the failover adapter resources. The first step is to know if the system is in failover. Then we now which resource we need and set this value on the JMSDestinationName. If we change the domain value of the failover column to Yes then the message is added to the jms_in2 queue and if the value is No then the messages is added to the jms_in queue. Standard are the internal esb queues jms memory queues. This is perfect for normal use but if you want to make an oracle esb cluster or make your own esb error handling then you can better make the esb queues database persistent. In this blog I will explain what to do. I installed the 10.1.3.1 soa suite and upgrade this to 10.1.3.3. Then I apply patch 10.1.3.3.1. (patchset 6492514). You have to apply this patch if you want to use the esb_error queue. 1. Go to the Administration tab, Enterprise Messaging Service, then Database Persistence. 2. On the Database Persistence configuration page, click Deploy. The Deploy Database Persistence Provider screen appears. 2. Click Create to create a connection factory. 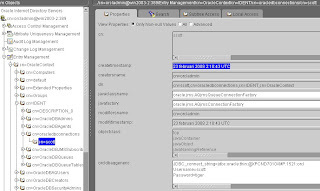 Select javax.jms.XATopicConnectionFactory from the Connection Factory and click Continue. 3. The Create Connection Factory screen appears. In the JNDI Location field, enter OracleOJMS/XATCF. Click Finish. 4. Click Create to create a connection factory. Select javax.jms.TopicConnectionFactory from the Connection Factory and click Continue. 5. The Create Connection Factory screen appears. In the JNDI Location field, enter OracleOJMS/TCF. Click Finish. 6. Click the Administered Objects tab and click Create. Select oracle.j2ee.ra.jms.generic.AdminObjectTopicImpl and click Continue. Now you can query the esb queue tables for errors. With ADF Taskflow you can make page fragments or pages with navigation and re-use this many times in your own applications. Build ones and implement many times. Oracle is doing this too with the webcenter components. These webcenter taskflows are isolated litte programs with its own page fragements and model. If you want to make your own re-usable taskflows then you have to know some things. In this blog I will explain the things you should know. First you have to create a fusion web application. You can ignore the adfc-config.xml this is an unbounded taskflow. Unbounded taskflow don't have a fixed beginning and ending, so it can't be used for the ADF library jar. You have to create a bounded taskflow. There are three different bounded taskflows. The first is the page fragments option. You can use page fragments to add functionality to your page. For example you make a customer info page fragment and include this on the order page or in your marketing application. The others two bounded taskflows are a bit different. 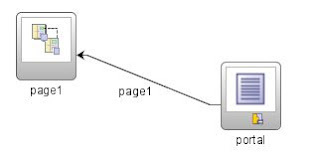 This is the train taskflow ( A train is a wizard to help the user to complete the transaction ) and the other is the normal taskflow with pages and methods like a logon flow or a order entry flow. With these two options you have to leave your page and the taskflow pages are shown and when you are ready then you can return to your page. First we create a bounded taskflow with page fragments. We open this taskflow and add a view from the taskflow menu. Create a page fragment on this view. The next step is to create a bounded taskflow without the option page fragements. 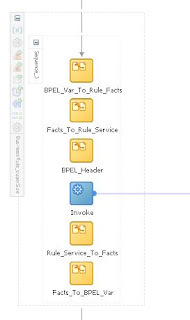 Here we also can create a view but now we create a page and we also create a taskflow return. Between the view and the return we add a flowcase with the name return. Open the jsf page and add a button with an action "return" else we can't go back to original page. To make this more interesting we add an input parameter to this taskflow and display the parameter on the jsf page. It is very important to give the page, taskflow and the package name unique names else you can get errors that it finds for example two datacontrols in the same package location or it uses the wrong page. The last step is to create an ADF library jar deployment profile. This deployment profile add all the bounded taskflows to the jar. This jar you can add as library to other fusion web applications. When you do this and you create or open a jsf page then in the component panel your new taskflow are displayed. Now you see there are two types. 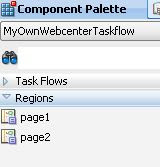 Taskflow and Regions, Regions are the taskflows with the page fragments option. You can also drag your own taskflow to the page. What now happens depends if the jsf page is part of an unbounded taskflow or not. If so then jdeveloper create a button with an action <af:commandButton text="page" action="page1"/> and update the unbounded taskflow. It adds a taskflow call and a control flow case. JDeveloper automatically detects the input parameters. 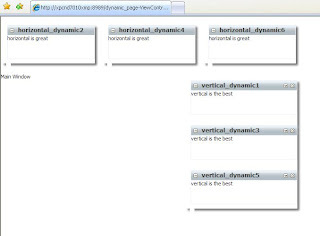 The 11g webcenter edition add customizable panels and Show Detail frames to jdeveloper. In this blog I use these frames to add some data to the header and right side of the page (like a homepage). I generate these frames from a backing bean. This ShowDetailFrame component is like a portlet window. You can drag these, re-order these panels or close them. You can use this for example to display some text from the database. This is how it looks. This is how I did it. First I create a jsf page where I add Panel Stretch Layout then I add a Customizable Panel to the top which has horizontal layout and one on the end which has a vertical layout. In the beforePhase of the view I add the init method which adds the ShowDetailFrames to the Customizable Panels.